This course combines the unique features of the British Canoe Union 3-star & Paddle Canada Level 2 skills into a program that includes a strong rescue/leadership component with kayak tripping theory and practice. Our intent is to run our BCU 3 star training course concurrently with the Paddle Canada level 2 skills certification course over a 4 day period. This allows 3 days to cover BCU syllabus plus an additional sea kayak overnight camping component to cover Paddle Canada level 2 skills syllabus. Participants who meet criteria will be able to obtain Paddle Canada Level II skills and take the BCU 3-star assessment at the course end. The mixing of British and Canadian course syllabus and skilled instructors with Lake Superior and the mouth of the Michipicoten River will result in a very unique and dynamic learning experience. BCU Sea Coach 3, BCU/UKCC Level 1 Coach, ACA Level 4 Open Water Instructor Trainer, ACA Eskimo Rolling Endorsement, Paddle Canada level 2 Instructor endorsement. 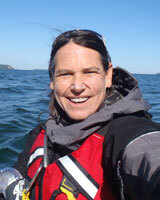 Bonnie teaches both Euro & Traditional paddling and teaches courses and leads trips from Scotland to Baja. Lake Superior and Naturally Superior Adventures is one of her favourite locations. PC: sk skills 4, Sk2, Tandem Canoe, SUP Instructor, Sk & SUP IT. BCU 4-star & ACA Coach 4. David established Naturally Superior Adventures in 1994 and has been guiding trips and teaching courses since then. The comprehensive nature of the combo intermediate Paddle Canada/BCU skills courses, makes this course one of his favourites. This course is for paddlers with well-practiced fundamental skills looking to refine their paddling and rescue techniques. Arrive prepared for wilderness camping and lots of time on and in the water. Sea kayaks, camping gear, paddling tops and wetsuits are provided as required. Beach camping is included and alternatively, rooms are available (at an additional cost) at Rock Island Lodge. Is this BCU 3- star training & PC Level 2 sea kayak skills course right for you? If you just graduated from BCU 1 star or PC Level 1, this course is not for you (yet). You’ll have practiced your skills and rescues and be comfortable and competent with them in waves up to 20 cm. You’ll have done at least three separate day trips covering at least 15 km each. You’ll have been out once in bumpy water and want to learn more. You’ll want to take your skill set from good to strong-intermediate. You’ll have your roll or be close to getting it. You’ll have also spent at least three hours exploring other paddling disciplines such as SUP, Canoe, WW kayak, etc. To BCU & PC Certify or to not BCU/PC Certify? That is the Question! Our objective is to provide you with skills required to safely and effectively plan and undertake overnight sea kayak trips in moderately exposed, open water conditions. Those wishing to attain certification will be assessed based on their planning, paddling and rescue skills in the context of an overnight sea kayak journey in appropriate conditions. You will be assessed separately for each course based on the criteria for each course. See detailed course descriptions for more detail. If certification is not important to you, great. Rest assured, you’ll be getting top notch instruction from qualified instructors who love sharing their passion for paddling with you. 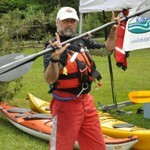 BCU 3-star/Paddle Canada Level II sea kayak syllabus . BCU 3 Star sea guidance notes .